It’s that magical time of year again! Brighton Fringe. Last year we came down for a few days to preview an early version of (No) Money in the Bank, and we had the best time. So naturally, we want to repeat that. 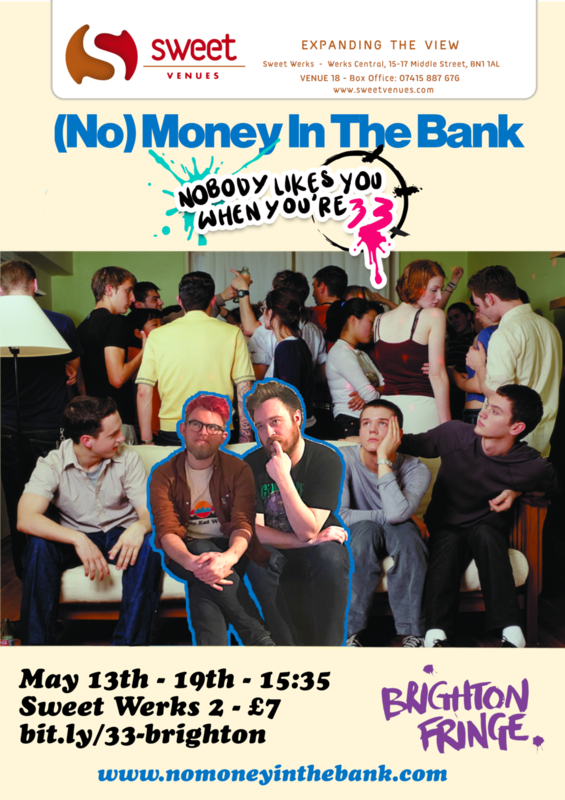 For an entire week between May 13th and 19th, we’ll be working with the fabulous Sweet Venues to give you a week of previews of the new show, Nobody Likes You When You’re 33. Our twisted love letter to punk and pop-punk. We’re stoked, and Thom is already planning on eating his own weight in vegan junk food. We’ll be performing 15:35 at Sweet Werks 2. If you’re near the area, get your tickets here! You can also mark yourself as attending or interested on the Facebook event to ease our anxiety. Get in touch if you plan to come! We’re trying to find a bunch of punk shows to watch while we’re in town and always happy for company.